Bundesliga | The next six Germany U-21 stars to win a World Cup? The next six Germany U-21 stars to win a World Cup? Germany have swept to victory at the UEFA European Under-21 Championship, beating Spain 1-0 in the final in Krakow to emulate the golden generation of 2009. No fewer than six players from that halcyon team – Manuel Neuer, Jerome Boateng, Mats Hummels, Benedikt Höwedes, Mesut Özil and Sami Khedira – went on to lift the FIFA World Cup five years later. Davie Selke endured a somewhat frustrating 2016/17 Bundesliga campaign at RB Leipzig, but showed enough potential in his frequent appearances from the bench to convince Hertha to take a punt on him this summer. He has certainly been on excellent form for the Germany U21s, top-scoring with seven goals in qualifying and carrying that form through to the tournament in Poland. The 22-year-old put Germany ahead in their 3-0 dismissal of Denmark in the group stage, and was also on target in the dramatic semi-final win over England, as Stefan Kuntz's side drew 2-2 and advanced to the final on penalties. Selke - who missed the final through injury - already has previous with the national side, having won the European Under-19 Championship in 2014 – where he finished as top scorer with six goals. With nine goals in his last 14 appearances, you wouldn't bet against him making a decisive contribution for the seniors in the not too distant future. Long before the Bundesliga was talking about Julian Brandt and Joshua Kimmich, Max Meyer was widely regarded as the future of the Germany midfield. Promoted from the Schalke youth ranks in 2013, the 21-year-old has been one of the Royal Blues' most consistent performers ever since. Even if he failed to hit his stride in a disappointing 2016/17, which saw Markus Weinzierl's men finish down in 10th, there is no denying Meyer's talent and enormous potential. He has certainly impressed in Poland, catching the eye in the semi-final win over England in particular. He had the distinction of scoring Germany's first goal of the tournament in the opening 2-0 win over the Czech Republic, and also teed up Marc-Oliver Kempf against Denmark. With nine attempts on goal and a pass completion rate of 90 per cent, Meyer is another player Spain will have to be wary of as he looks to add to his seven goals in 23 outings for the U21s. Watch: How do Max Meyer and Julian Brandt measure up? Hoffenheim made plenty of headlines during their remarkable 2016/17, though the plaudits were often reserved for their coach Julian Nagelsmann. Sebastian Rudy and Niklas Süle did enough to earn themselves moves to Bayern Munich, but it takes more than a few star individuals to be the last undefeated team in Europe's top five leagues, and Jeremy Toljan's contribution was frequently overlooked. Highly versatile, the 22-year-old was capable of playing anywhere up the left or right flank, and remained a consistent performer in spite of missing several months with injury. He has played almost every minute in Poland, chipping in with two assists and two clean sheets. Deployed as a right-back by Kuntz, he has linked up well with Meyer and Mitchell Weiser, completing 89 per cent of his passes and looking to add danger from out wide. Having turned down the chance to represent both Croatia and the USA, Toljan looks certain to have a future in the senior Germany side. The captain of the side and the oldest members of the squad, Wolfsburg midfielder Maximilian Arnold has set a fine example in Poland. The 23-year-old has scarcely missed a kick for Stefan Kuntz's troupe, calling on his vast Bundesliga, UEFA Champions League and UEFA Europa League experience along the way. Arnold, a midfielder by trade, is without doubt a big reason why Germany have got as far as they have – not least after providing the pass for Felix Platte's equaliser in the 2-2 semi-final draw with England. He opened the scoring in the ensuing shoot-out – hardly a surprise given his trademark heart-on-the-sleeve mentality - and now appears ripe for the senior side having only earned one full international cap to date. Julian Pollersbeck was the scourge of the England team in Tychy, saving penalties from Tammy Abraham and Nathan Redmond in the shoot-out. Footage of the 22-year-old delving into his sock to consult what many assumed were notes on England’s penalty takers went viral, but later proved to be a bluff. As well as being wise beyond his years, Pollersbeck is a fine shot-stopper with a strong command of his area. He was the standout in a below-par Kaiserslautern team in Bundesliga 2 last term and, after moving to Bundesliga ever-presents Hamburg this summer, looks set to become a permanent fixture in the German top flight for years to come. 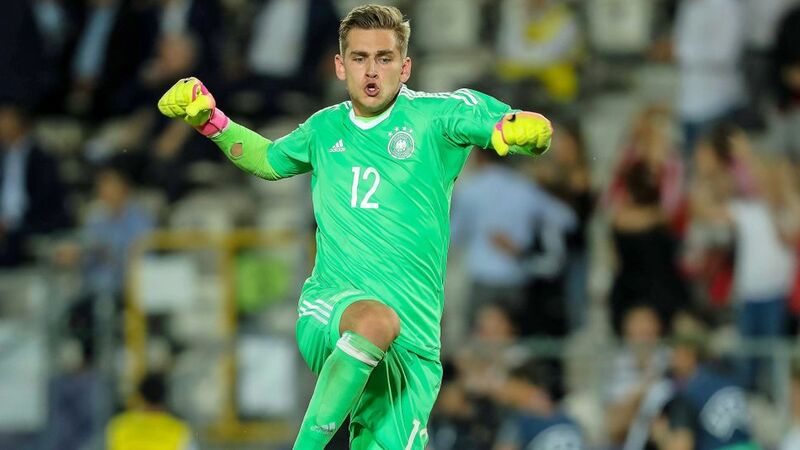 Manuel Neuer, watch your back! Playing every minute at the finals, Freiburg's Marc-Oliver Kempf underpins the team much as Boateng did eight years ago in Sweden. Strong in the tackle and a supremely adept ball-playing centre-back, the 22-year-old has completed more passes than anyone else at the tournament with an eye-watering completion rate of 92 per cent. Kempf’s achievements are even more impressive, considering he missed the first 21 matches of the 2016/17 Bundesliga campaign through injury. He was involved in the remaining 13, however, galvanising promoted Freiburg's unexpected push for European football. Boyhood club Eintracht Frankfurt must be wondering how they let him get away.